I fell hard for the Ghost 4 right away—I loved their smooth ride, bouncy feel, and lighter construction. They held up throughout marathon training, and the marathon itself - never once dragging me and still feeling springy at the end. They’ll definitely continue to be my go-to trainers. Neutral runners looking for an all-around shoe appropriate for both speed work and long runs; neutral runners that prefer a soft, flexible shoe that can stand up to high-mileage workouts. After the highly-successful Ghost 3, Brooks went with a more conservative update for the Ghost 4, only improving on the Ghost 3’s advantages. Leaving the overall fit untouched, Brooks rebuilt the sole unit while trying and leaving the feel unchanged. The most noticeable changes from the Ghost 3 are the heel and forefoot cushioning, and the crash pad in the heel, which is more segmented allowing for additional flexibility. Another key change to the Ghost 4 is Brooks’ DNA system -a patented cushioning system that is designed to adapt to a runner’s foot. Overall, Brooks has created a more balanced and lighter trainer, which allows the foot to move naturally without sacrificing support and cushioning. I admit that I was really excited to try the Brooks Ghost 4 from the beginning, and I wasn’t disappointed once I began wearing them. From my very first run in them I was hooked, and found myself reaching for them again and again. The Ghost 4 has a nice blend of support and flexibility, which is evident immediately. The soft, flexible sole and lightweight upper make for a smooth heel-to-toe transition, providing plenty of bounce and a great kick throughout the entire run. 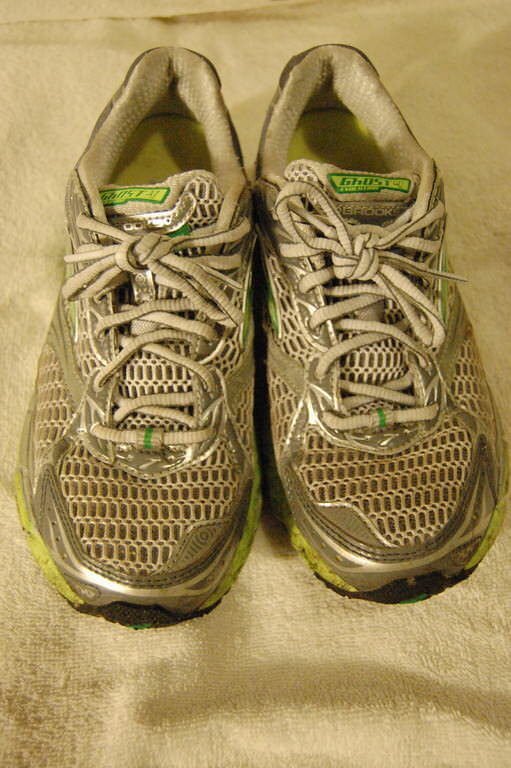 After running in them for about a week, I decided that they would be the shoes for my next marathon. 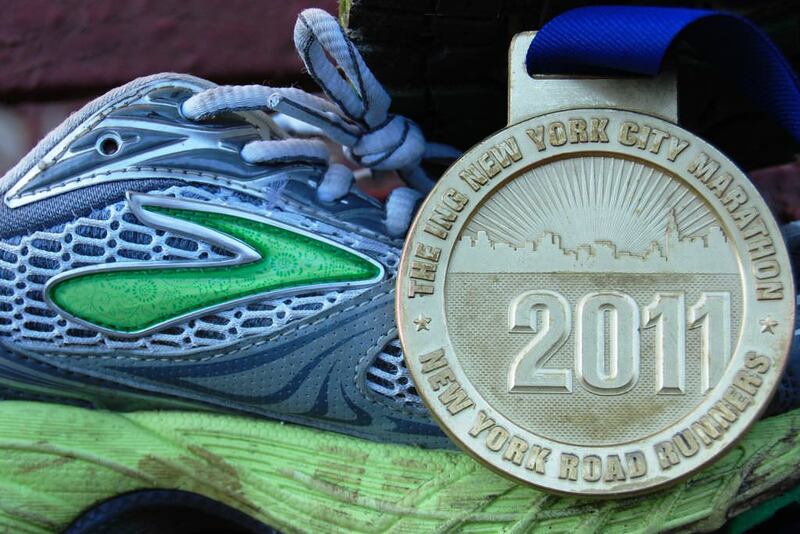 The Ghost 4 held up great throughout my 20-mile training runs, and even better during 26.2 miles through the streets of New York City. Never once feeling heavy -even through the long runs -the Ghost 4 was soft enough to protect my legs from the pounding, yet still allowed me to feel the road beneath me. I put them through quite a bit this summer, running through rain and heat, on pavement and trails, and the Ghost 4 never let me down. Brooks has struck a great balance with the Ghost 4, blending support with a lightweight construction. The end result is a trainer that protects runners from the impact of the road without interfering with the wearer’s gait. The sole unit of the Ghost 4 has been updated for the new version to create a smoother heel-to-toe transition and a smoother ride. The caterpillar crash pad at the heel is more segmented in this version than in the Ghost 4, with wider “Omega Flex Grooves,” adding more flexibility to the heel section. The flex grooves are narrower at the top and are designed to open out with each step, allowing the shoe to flex with the runner’s foot and provide a more natural feel. 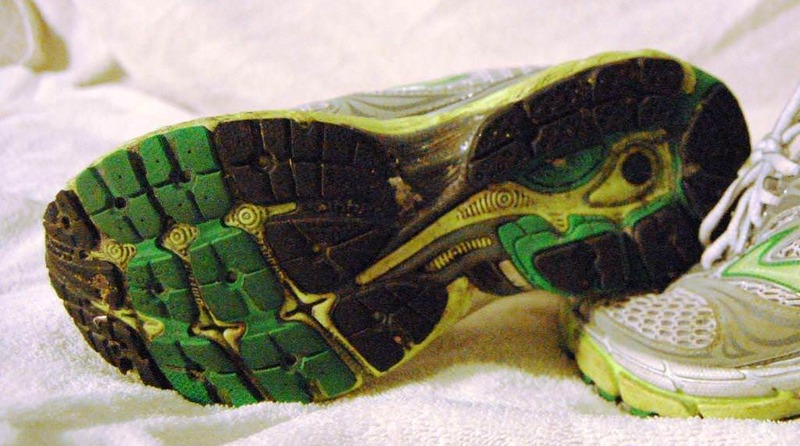 Replacing the HydroFlow system (plastic packets of a viscous fluid) as the primary cushioning in the sole, Brooks DNA cushioning is slightly lighter and is much more responsive. Unlike the older HydroFlow system, DNA actually adapts to each runner, reacting to the impact of an individual’s gait. The midsole also features the DNA system as well as a small plastic shank, meant to provide additional support by keeping the foot stable. When taking my first look at the shoes, I admit that I was concerned that they would make for a clunky ride, but Brooks has made the lateral side less stiff than the medial side, allowing for support without interfering with the ride. Ultimately, the sole unit is flexible and cushioned, allowing wearers to move naturally while remaining supportive enough for long runs. Brooks has kept the upper unit simple on the Ghost 4. The upper consists of a microfiber layer, topped by an additional mesh layer. Overall, the shoe handles moisture well, and performs well under all conditions. 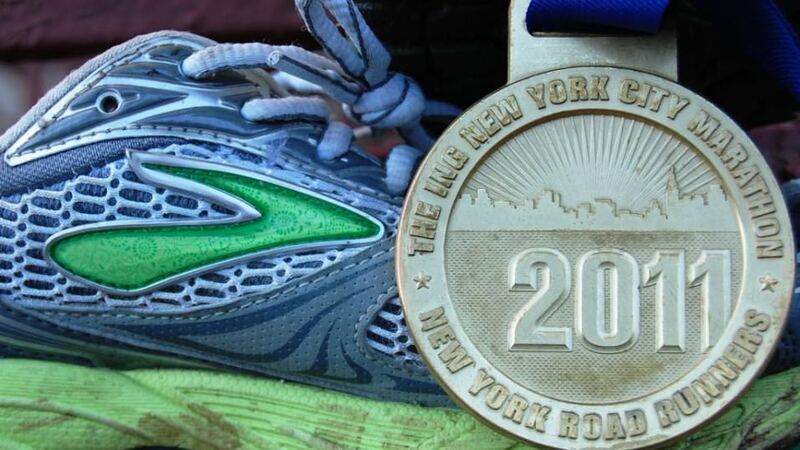 Running through humid summer days -and even sudden October snowstorms in New York City -the upper held strong, and kept my feet dry in all but the soggiest of conditions. Even on a hot day, my feet stayed cool and comfortable. In the middle of the long hours put in while marathon training, this comfort makes a world of difference. The Ghost 4 performed well even on long tempo runs through the rain. Even more importantly, the upper dried quickly, and the shoes were ready for another session the very next morning. The Ghost 4 would be a great option for a variety of runners—ranging from beginners and veterans alike. While the upper is without many of the bells and whistles so common in running shoes today, the sole unit has clearly been the focus of the design process, and Brooks has found a great balance between support and flexibility. Perhaps best of all, the Ghost 4 is a versatile shoe that performs well in a variety of conditions. 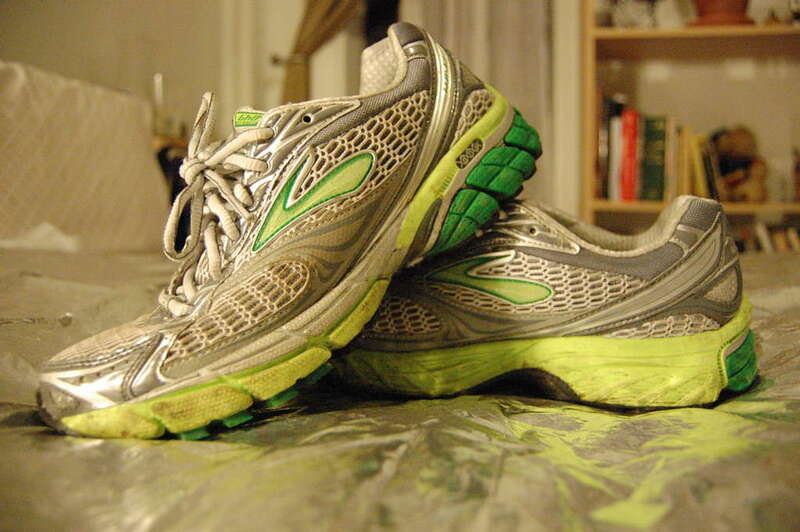 I felt just as comfortable in them on the track as I did on my favorite roads or a light trail. 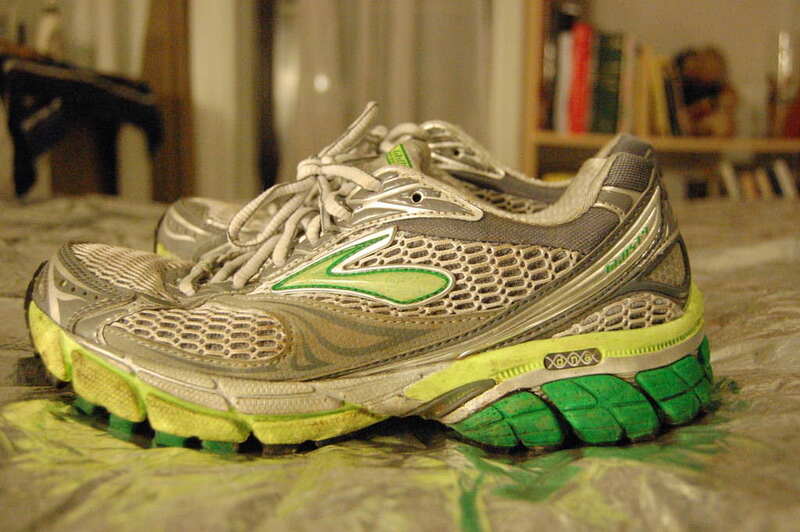 The Ghost rides similar to other Brooks shoes like the Adrenaline, with a slightly more minimal feel. The one thing I don’t like about the shoe is that the tread picks up gravel. You run down the road sounding like you’re wearing a pair of horse shoes. I have been using the Ghost 3 and just bought the Ghost 4 and it is true, the bounce you get from these shoes is amazing. My first day running with them I felt I could run all day long. They are a bit snug around the toes at first, but they break in easy enough. I’ve only worn them a few times, but I am very pleased with them so far. I don’t know about all the technical shoe stuff reviewers write about. 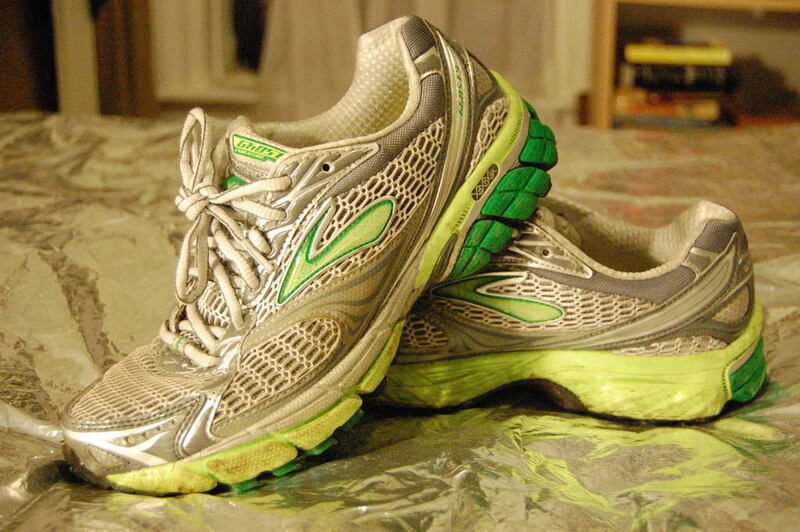 I just know I like running in my Brooks Ghost 4s. I find these shoes to be very comfortable. They are currently my favorites to train in. My only complaint is the out sole. The forefoot is made out of this soft rubber. It wears out really quickly. Don’t get me wrong, I still logged a lot of miles in my first pair, but I could have logged a lot more with a better out sole rubber in the forefoot. But let me reiterate, they are very comfortable. I am an under-pronated runner with a mid-foot strike. I agree. I bought these along with the Mizuno Wave Rider 15 several months ago. I have been alternating between them for running, trying to keep the distance on each of them about the same. I have put about 150 miles on each, but whereas the WR15 shows very little tread wear, the Ghost’s forefoot tread is starting to wear down. I am a midfoot/forefoot striker so I expect this area of the shoe to wear more quickly, but not this quickly. I had the Ghost 3 before this and looking now I noticed the same kind of wear, although since I was alternating between two pairs of them, I didn’t have a different shoe to use for comparison. The Ghost 4 are comfortable (although I think I liked the 3s better), and if I can get the 4 or even the 5 (which may have less problems with this type of wear due to caterpillar crash pad being extended into the forefoot) for a good deal, I would pick up a pair, but with the knowledge that they might wear out faster than other shoes. Narrow toe pocket…..I wear a narrow street shoe (10.5 B) so I bought that size and wore them in the house with a very thin sock. The Ghost 4 started causing foot squeeze pain and I returned them. Other than the toe pocket problem, the shoe looked good. And since the shoe had good reviews, I decided to order the medium width. Received the mediums and had the exact same squeeze problem. My suggestion is to find a running store near you and try on the shoe of interest before you buy.